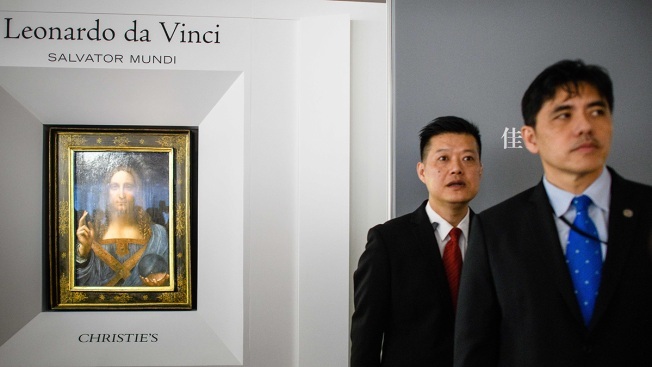 This picture taken on October 13, 2017, shows a man (R, wearing blue tie) identified by local Hong Kong media as former CIA agent Jerry Chun Shing Lee standing in front of a member of security at the unveiling of Leonardo da Vinci's 'Salvator Mundi' painting at the Christie's showroom in Hong Kong. An accused Chinese spy and former CIA officer had an accomplice in his alleged espionage against the U.S., NBC News reported. Jerry Chun Shing Lee, 53, was arrested in January 2018 when he arrived in the U.S. on a flight from Hong Kong and was initially charged with illegally possessing classified information: two handwritten notebooks containing names and phone numbers of covert CIA employees and informants. A secret FBI-CIA task force investigating the case concluded that the Chinese government penetrated the CIA's method of clandestine communication with its spies, NBC News first reported in January, then used that knowledge to arrest and execute at least 20 CIA informants, according to multiple current and former U.S. government officials. The disclosure of the second individual as an unindicted co-conspirator in the high profile espionage case was made Wednesday in an order on the case by federal judge T.S. Ellis III.